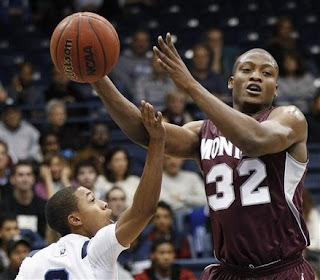 Congratulations to the Montana Grizzlies. After beating Weber State 85-66 in the Big Sky title game, they will be headed to the NCAA Tournament. I thought that if they won, they would do it because they are the best defensive team in the conference. Instead, they did it by being almost literally unstoppable offensively in the second half. Weber State led 36-31 at the break, but it was all Montana in the second half, as they outscored the Wildcats 54-30 after the intermission. In the second half, they simply could not be stopped. They were 19/32 from the field in the second half, including 8/12 from downtown. Mathias Ward started out the half by giving them big shot after big shot. He was firing on all cylinders, and finished with 23 points on 10/16 shooting. Offensively he is one of the most diverse big men in the conference, and he showed it in this one. He also had eight rebounds. From there, it was Kareem Jamar that took over offensively. He seemed to hit from everywhere on the court... at one point the announcer said Damian Lillard just looked over at Randy Rahe and shook his head. Sometimes, there is not much that you can do. Jamar finished with 23 points (on 9/12 FG, 5/8 3PT) and seven assists. He was fantastic all tournament long and was the Big Sky Conference Tournament MVP. Well deserved. All other starters were in double figures for the Griz. Will Cherry finished with 13 points and six assists. Derek Selvig had 16 points, including 13 in the first half when he kept the Grizzlies in it. Art Steward had 10 points and seven rebounds. The bench played only nine minutes combined, as it was the starters that carried the day. For Weber State, it's a tough way to go out. Damian Lillard played great for most of the night (had one stretch where he was a bit too passive) and finished with 29 points, ten rebounds, and seven assists. However, he just didn't get a lot of help. Byron Fulton had ten points, and Kyle Tresnak had 12, but nobody else was in double figures. It was the same story for WSU offensively as last week... they simply didn't look like they knew what to do for most of the night against the Montana zone. They stopped being aggressive, and jacked up too many threes. It worked in the second half, but they couldn't keep it going. Montana has won 14 straight games, and 20 of their last 21. They will head to the tournament as hot as any team in the country. They are currently projected by most pundits as a 15 seed, and I would not want to see them in my bracket if I was a 2 seed. They have the type of balanced offense and stout defense that could make them a candidate to pull a shocker in the NCAA Tournament.